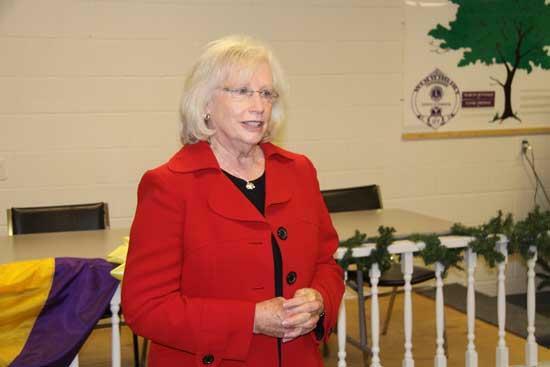 State Sen. Mae Beavers speaks to constituents during a Meet and Greet at the Woodbury Lions Club, Dec. 2. Mae Beavers spent eight years in the Tennessee House of Representatives, and she has spent as many serving as a state senator. Still, there will be somewhat of a different feel when Beavers (R) is sworn in as the 17th District State Senator Jan. 15. Beavers and newly-elected Tennessee House of Representative Mark Pody (R) were in Woodbury for a meet and greet with citizens at the Woodbury Lions Club Building Thursday (Dec. 2). They told those in attendance they are ready to get to work and start accomplishing goals that will benefit citizens in their district. Pody will not be sworn in until Jan. 15, but he said he already is working to bring new businesses to Woodbury. “The first thing I have been doing is contacting companies,” Pody said. “I have a company I am bringing to visit Cannon County. They want something between 9-to-10,000 square foot in warehouse space for a factory and such. Shirley (Borren) has been nice enough to take me around to different places and I was able to take pictures and send them back so the business can get a head start on what we have to offer. Pody also said he will be in Cannon County at least once a month for the next two years so constituents can meet with him regarding concerns they may have, rather than having to come to Nashville. Pody, who represents the 46th Tennessee House District, already has put his name in the hat to be considered for various committees, most notably Agriculture and Commerce. Beavers said the excitement of several new faces and ideas is building as the inauguration approaches. And then the business of rolling up the sleeves and getting to work takes place. Beavers and Pody say they are more than ready to begin the process of making a difference within their district and throughout Tennessee. Looked like a fairly sedate meeting. None of that holy roller stuff like back in October. I wish you could have been there dailyreader. I looked for you, but you stood me up. I saved you a dance and everything. Oh well, maybe next time. We had good barbeque and some good talk and I look forward to Mark working for the people of Cannon County.